aFrom the Division of Neuroradiology, Department of Radiology, University of Michigan Health System, Ann Arbor, Michigan. SUMMARY: Imaging of the head and neck was initially described within the first year after Roentgen's discovery of the x-ray and was used to localize foreign bodies in the head and neck area, including the orbital, laryngeal, and esophageal regions. Subsequently, x-rays were used to evaluate the air-filled paranasal sinuses, the pneumatized temporal bone, and the upper aerodigestive tract. Special views for evaluating these structures were developed by early investigators. As contrast agents were developed, a variety of invasive procedures were developed to assess the structures of the head and neck. CT and MR imaging were applied to the extracranial head and neck slightly later than the brain and spine; these modalities revolutionized head and neck radiology, finally allowing assessment of the deeper structures of this complex anatomic region. Imaging of the head and neck region began shortly after the discovery of x-rays. With time, radiographic technique advanced, and various radiographic procedures related to the head and neck region were introduced. Until the advent of CT and MR imaging, the radiologist could only detect disease in the head and neck region if it altered or destroyed bone or impinged on a normally air-filled structure. Cross-sectional imaging finally allowed the noninvasive visualization of the deeper structures of the complex head and neck region and altered how patients with diseases affecting this region are diagnosed and treated. A, Waters view of the paranasal sinuses with a depressed right orbital floor fracture (white arrow) and an opacified right maxillary sinus (black arrow). 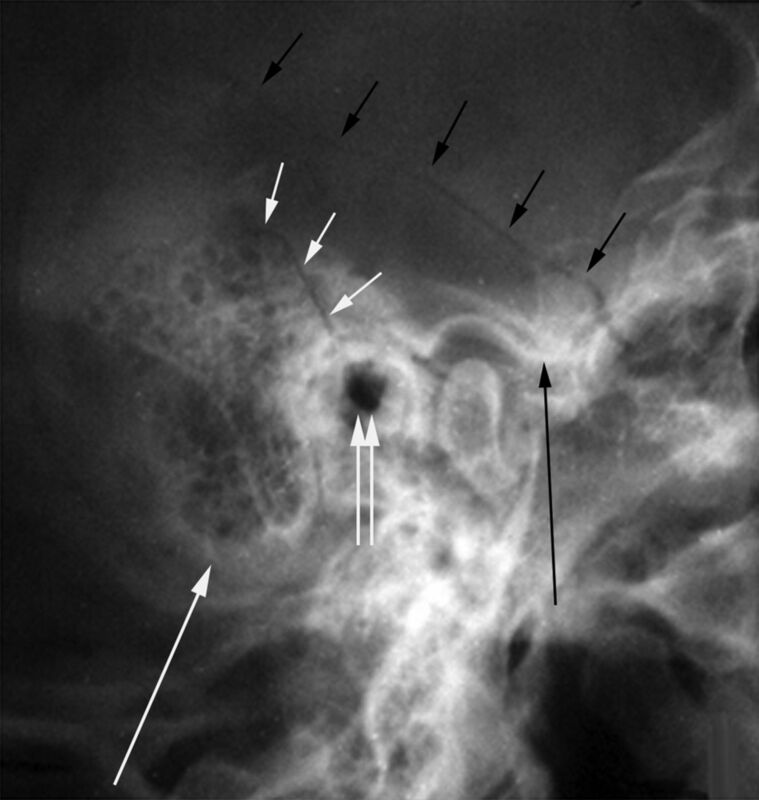 B, Coronal tomogram in a different patient shows a left orbital floor fracture (white arrows) with partial left maxillary sinus opacification (black arrows). Schüller view of the temporal bone showing a fracture (short white arrows) extending through the squamosal temporal bone, anterior to the mastoid process (long white arrow) and into the external auditory canal (double white arrows). A second fracture (short black arrows) extends through the parietal bone, into the squamosal temporal bone, and then into the skull base just anterior to the articular eminence (large black arrow) of the temporal bone. A 20-year-old man with a lump near the angle of the mandible. 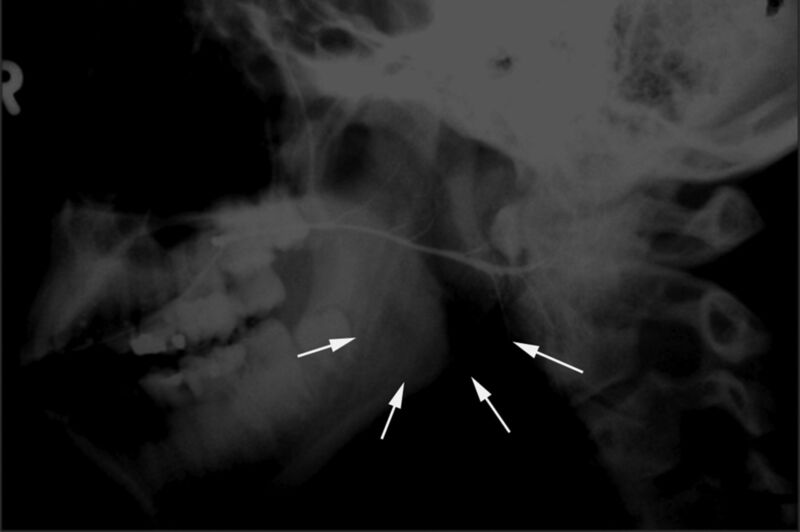 Oblique view from a parotid sialogram shows distortion of secondary ducts and a “ductless” appearance (arrows) near the angle of the mandible, related to a pleomorphic adenoma of the parotid gland. A 59-year-old man with left proptosis and negative findings on orbital x-rays and tomograms. 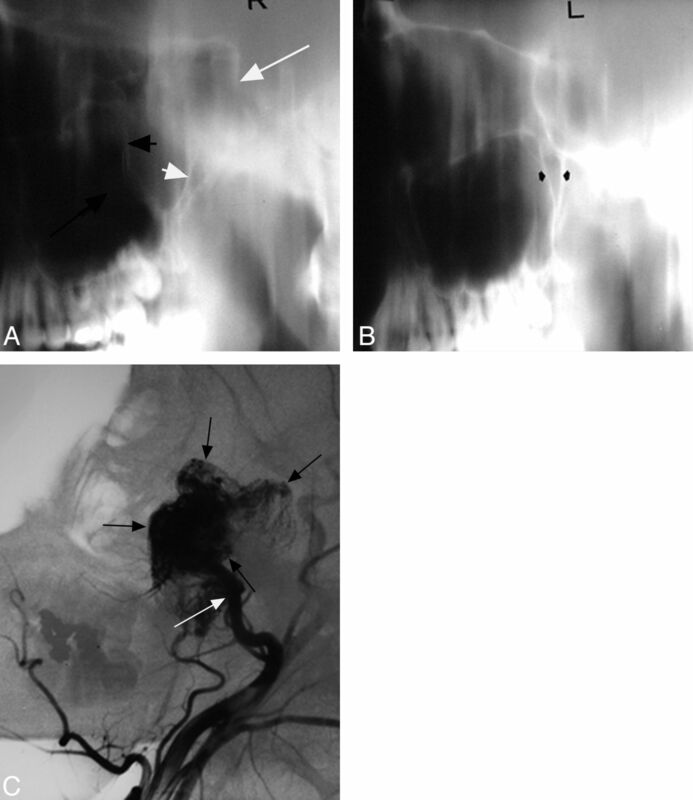 Orbital venography was performed following percutaneous puncture of a lateral frontal vein. Frontal view from an orbital venogram (A) shows medial displacement of the anterior and midportions of the left superior ophthalmic vein (SOV) (white arrows) compared with the right (black arrows). Lateral view from an orbital venogram (B) demonstrates inferior displacement of the left SOV (open arrows) compared with the right (solid arrows). Imaging findings are suggestive of a tumor in the anterior and midportion of the orbit laterally. Biopsy of mass revealed lacrimal gland carcinoma. Adolescent boy with epistaxis. Lateral tomogram through the right side of the nasopharynx (A) shows a nasopharyngeal mass extending into and enlarging the pterygopalatine fossa with forward bowing of the posterior wall of the maxillary antrum (short black arrow) and posterior displacement of the pterygoid process (short white arrow). The mass also extends into the anterior half of the sphenoid sinus (long white arrow) and right maxillary antrum (long black arrow). B, Lateral tomogram through the left side of the nasopharynx shows a normal pterygopalatine fossa (arrows). C, Lateral view from the right external carotid artery angiogram shows a very vascular mass (black arrows) in the nasopharynx, right pterygopalatine fossa, anterior sphenoid sinus, posterior right maxillary sinus, and posterior inferior right orbit. Supply is from the internal maxillary artery (white arrow). Conventional radiography remained a mainstay in head and neck imaging with advances made with time in the imaging of this region. Radiographic technique was varied to accentuate different structures, as seen in the following examples. A high-kilovoltage selective filtration technique was developed for radiography of the larynx in an effort to minimize confusion from the overlapping shadows of the cervical spine.7,51 Fluoroscopic and spot-film examination of the larynx was also performed, particularly to assess the vocal cords and subglottic region. This examination could be performed quickly on equipment available in most radiology departments without the use of a contrast agent and no need for anesthesia or other patient preparation.52,53 The use of xeroradiography of the larynx was also advocated to improve delineation of the larynx and surrounding soft tissues.54 Multiple radiographic views were developed to fully assess the detailed overlapping anatomy of the head and neck. A 1938 article by Shebesta55 indicated that at least 24 projections for imaging the temporal bone had been described by that time, which sometimes led to confusion among radiologists as to which views should be obtained. As with imaging of the brain and spine, profound advances have been made in head and neck imaging that have had a positive impact on the diagnosis and treatment of patients. Until the emergence of CT and MR imaging, radiologists were mainly limited to diagnosing disease after it opacified a normally air-filled structure or destroyed bone. A variety of invasive procedures added little to the radiologic armamentarium at that time. The currently available cross-sectional imaging techniques allow accurate depiction of the complex anatomy and pathologic processes of the head and neck regions that was likely undreamed of in the early days of radiology and have advanced the diagnosis and treatment of patients. We expect that progress will continue in the future, which will lead to even less invasive, safer, faster, more specific diagnostic techniques, resulting in even earlier diagnosis and treatment with a continuing positive impact on patient outcome. Disclosures: Suresh Mukherji—UNRELATED: Consultancy: Phillips Healthcare, Comments: MRI consultant.